Tulsi (Holy Basil) Ocimum tenuiflorum. Tulsi has a lot of reverence for the Hindus. 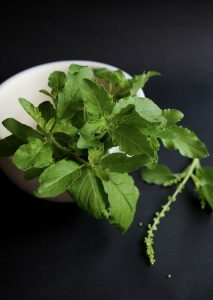 In fact, people worship Tulsi everyday in the morning as well as evening time. Most homes will have a plant as it’s considered sacred, not least because of its many medicinal qualities. I am now using this exceptional herb in my clinic – as it has only very recently become available as a tincture – with wonderful results. Tulsi is rejuvenating, immune boosting, helps restore our bodies negative reaction to stress, removes fluoride from water, has a wonderful effect on the adrenal glands and cardiovascular and nervous system and is anti fungal, so is a great herb to treat a candida overgrowth. If you grow it yourself at home (easy), add the fresh leaves to your salads, stir fry’s, curry and smoothies. You probably won’t find Tulsi seeds or plants at your local nursery so ask them to order them for you, or look on-line. You’ll find it in health food stores as a supplement, tea or liquid tincture. A friend dries her organic tulsi, calendula and rose petals in her dehydrator, then kindly shares the tea with me.